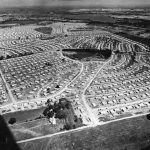 Levittown, Pennsylvania, located in Lower Bucks County about ten miles beyond Northeast Philadelphia, emerged just beyond the inner suburb ring in the post-World War II period. 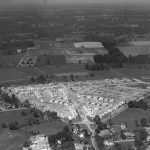 In 1951, Levitt and Sons bought 5,750 acres of broccoli and spinach farmland near the newly constructed U.S. Steel Corporation’s Fairless Works plant to provide housing for the plant’s employees. The availability of industrial jobs at the Fairless Works plant and the loan guarantees provided by the Veterans Administration made the act of purchasing a new home in Levittown attractive for returning soldiers. 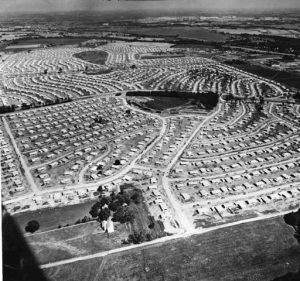 The construction of Levittown, in progress here in 1952, lasted until 1958, resulting in over 17,300 new suburban homes. Founded in 1644 by Swedish settlers, Chester, Pennsylvania, located a few miles south of Philadelphia along the Delaware River, transformed itself into a center of manufacturing and industry during the nineteenth century. Chester officially became a city in 1866 and continued to grow in population as World War I brought a higher demand for the industrial labor. Throughout the first half of the twentieth century Chester thrived as an inner suburb mirroring many of the accommodations that could be found in Philadelphia. 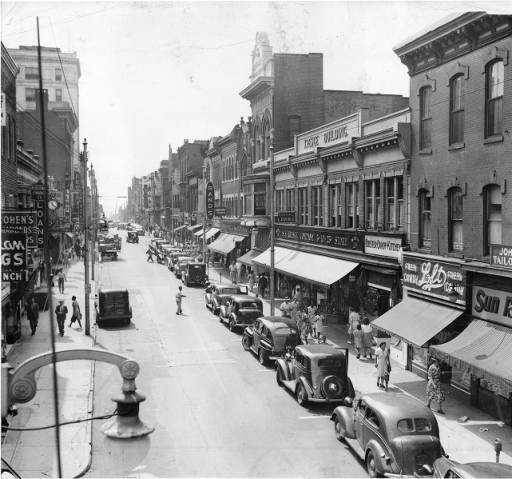 Market Street, the main street of Chester, is shown here in 1942, featuring a variety of retail establishments. 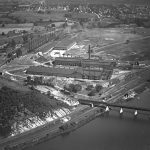 The consistent growth of Chester came to an end following World War II, as with many of Philadelphia’s manufacturing-based inner suburbs. The deindustrialization of the area impacted Chester as many residents left the city in the 1960s to pursue new employment opportunities. The Hollywood housing development, shown here in 1928, is located sixteen miles north of Center City Philadelphia in Abington, Pennsylvania. The Hollywood housing development was conceived by developer Gustav Weber after a trip to the West Coast. The community consists of mission-style homes and Mediterranean landscaping, much of which had to be modified because the plants could not withstand the northern climate. The project began in 1928 but was abandoned by Weber when he went into bankruptcy during the Great Depression. It was eventually completed in the 1940s by Montgomery County developer Sidney Robin. During the nineteenth century, many towns along waterways developed as centers of manufacturing in the era of industrialization and became working-class suburbs. One of these working-class inner suburbs was Conshohocken, located west of downtown Philadelphia, ten miles up the Schuylkill River. Conshohocken spawned iron works on a canal alongside an unnavigable stretch of river. The first foundry was built in 1844. The longest-surviving firm was Alan Wood & Co., shown here in 1915, which established the Schuylkill Iron Works plant there in 1857. By 1920, Alan Wood Steel could produce five hundred thousand tons of steel a year. 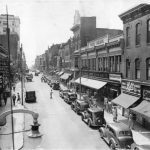 It remained the economic mainstay of Conshohocken until the mid-twentieth century. As some of Philadelphia’s inner suburbs declined due to deindustrialization, others possessed qualities that positioned them to prosper. 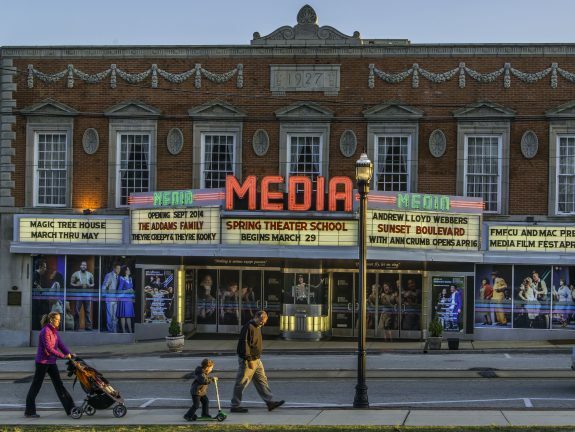 Many smaller boroughs offered the charm, walkability, sense of community, and main street orientation that the Delaware Valley Regional Planning Commission touted in its promotional campaign for the region’s treasured “Classic Towns.” One of these was the borough of Media, Pennsylvania, whose Media Theatre is shown here in 2014. Media was built on farmland in the 1850s as the new county seat of Delaware County. The county, which was carved from Chester County in 1789, lies in the southeastern corner of the state along the Delaware River between Philadelphia and the state of Delaware. 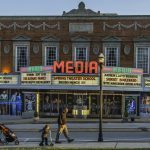 Located west of Philadelphia, Media is an early example of a “planned community,” intended as both a commercial center and a place to conduct court and county government business. Clustered around the city boundaries, the inner suburbs formed a contiguous ring of older jurisdictions where the majority of the houses dated to 1970 or before. This buffer, extending out about eight miles from Philadelphia’s city limits, corresponded roughly to the service area of the region’s popular commuter rail system, shown as green lines on this map. Early suburban development coalesced along these routes. The region’s inner suburbs can be defined as including the townships, boroughs, and a few cities just beyond Philadelphia’s border, including parts of Pennsylvania’s Delaware, Chester, Montgomery, and Bucks Counties as well as New Jersey’s Burlington, Camden, and Gloucester Counties. As the City of Philadelphia's population declined after 1970, its inner and outer suburbs continued to grow at a rate that gave the metropolitan area overall growth between 1940 and 2010. Presenting a varied and complicated patchwork of both thriving and distressed communities, Philadelphia’s inner suburbs developed during different eras to serve different purposes and populations. European influence predated the Revolutionary War with English, Swedish, Dutch, and Welsh settlers establishing tight-knit farming communities in what were then outlying areas of William Penn’s Philadelphia. 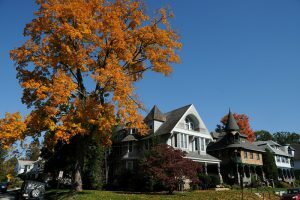 During the eighteenth and nineteenth centuries of slow but steady population increase, stately mansions were built in many of these well-positioned borderland communities as summer homes for wealthy Philadelphians while other communities were setting the foundation to become vibrant industrial towns. Beyond a common penchant toward small-town life and local allegiance, during the twentieth century these communities acquired different identities ranging from upscale hamlets with storied histories of housing wealthy families for more than a century, to working-class towns rooted in manufacturing, to post-World War II suburbs whose middle-class housing began to lose value by the end of the century. These early suburban communities represented a critical juncture in metropolitan dynamics as the first places outside of the city limits to experience rapid population growth during the twentieth century such that their residents were still essentially connected to the urban core while adopting new localized daily routines that began to disconnect them functionally from an urban sensibility. Clustered around the city boundaries, the inner suburbs formed a contiguous ring of older jurisdictions within which the majority of housing dated to 1970 or before. This buffer, extending out approximately eight miles from Philadelphia’s city limits, corresponded roughly to the service area of the region’s popular commuter rail system along which early suburban development coalesced. 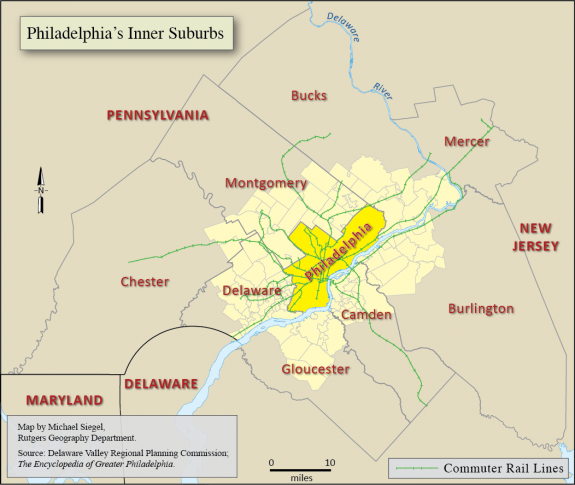 As such, the region’s inner suburbs could be considered to include the townships, boroughs, and a few cities within eight miles of Philadelphia’s border in Pennsylvania’s Delaware, Chester, Montgomery, and Bucks Counties as well as New Jersey’s Burlington, Camden, and Gloucester Counties. U.S. Census population figures attested to an enduring attraction of inner suburbs to the region’s residents. 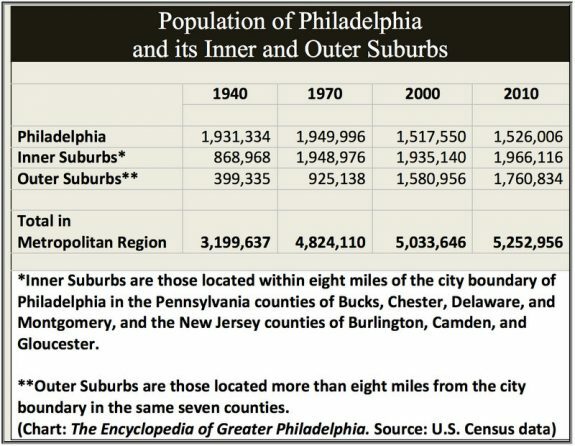 During the post-World War II era of mass suburbanization, migration flowed mainly to the inner suburbs that grew to be almost equal to the population of Philadelphia by 1970. At the close of the twentieth century, population in the inner suburbs well exceeded that in either the city or the outer suburbs. 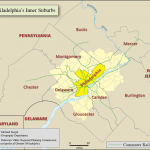 This relationship persisted through the 2010 Census with the inner suburbs home to a greater proportion of the metropolitan region’s population (37 percent) compared to either Philadelphia or the outer suburbs (29 percent and 34 percent, respectively). During the nineteenth century, many towns along waterways developed as centers of manufacturing in the era of industrialization and became working-class suburbs. Water power and transportation influenced development in places such as Upper Darby, Pennsylvania, where the abundance of creeks and streams allowed for the development of mill towns. Along the Delaware River, Chester, Pennsylvania, became known for its shipyards and factory work in the early 1900s. Paulsboro, New Jersey, home to the Port of Paulsboro, developed its capacity for petroleum transfer and manufacturing. Industrial parks were situated in Pennsauken, on the New Jersey side of the Delaware River. 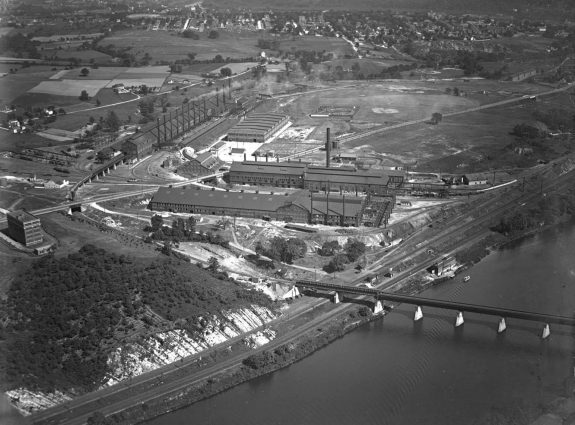 The boroughs of Conshohocken and West Conshohocken, Pennsylvania, along the Schuylkill River, became centers for steel and iron production. Although places that formed this suburban inner ring had unique longstanding histories, the introduction of rail lines in the mid-1800s shaped modern municipal demarcations. One string of affluent inner suburban communities, encompassing parts of Lower Merion and Radnor, Pennsylvania, acquired its moniker as “the Main Line” because the Main Line of the Pennsylvania Railroad ran through these towns. These “bourgeois utopias” with their ample supply of sprawling estates remained prosperous and prestigious areas. In Camden County, New Jersey, a pair of high-income suburbs with lengthy histories similarly retained their appeal for wealthy residents. 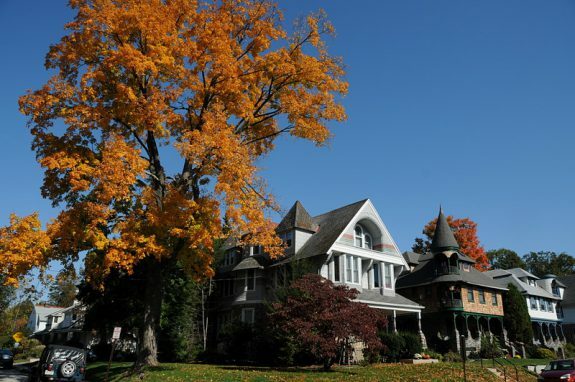 Haddonfield and Haddon Heights were built as classically laid-out towns with large homes that drew affluent professionals. Railroad connections were integral to the plans of both communities, initially to the Camden and Atlantic Railroad and by 1969 to the PATCO high speed line. The region’s suburban footprint changed dramatically with the mass suburbanization that defined the post-World War II period. 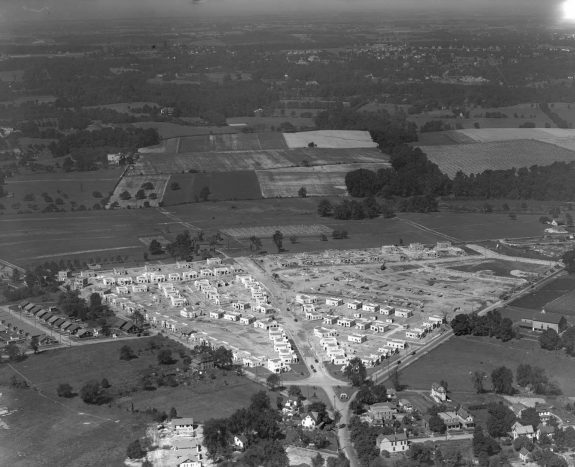 Tract housing subdivisions transformed many of Greater Philadelphia’s inner ring agricultural areas into middle- and working-class bedroom suburbs to mirror the nationwide trend. Levitt and Sons builders chose Greater Philadelphia’s inner suburbs for two of its iconic Levittown communities, one spanning four jurisdictions in Pennsylvania’s Lower Bucks County and the other in Willingboro, New Jersey. Population in the inner suburbs mushroomed. For example, in Lower Moreland, Pennsylvania, a 1940 resident count of 1,451 grew to 11,665 by 1970. In Deptford, New Jersey, a 1940 resident count of 4,738 grew to 24,232 by 1970. With the construction of an extensive network of highways and roads, inner suburbs drew middle- and working-class households seeking the quintessential American dream of owning a single-family home in a neighborhood with good schools, a safe and community-oriented environment, and easy automobile access to anywhere in the metropolitan region. White flight from city neighborhoods fueled the dramatic population increases in the inner suburbs between 1945 and 1970. After 1970, African Americans began moving into suburbs where a pattern of disinvestment in aging homes had lowered prices enough to make them affordable. Typically, declining housing conditions preceded the arrival of minority buyers, yet many white residents assumed the reverse—namely, that the arrival of minority residents caused housing conditions to deteriorate. 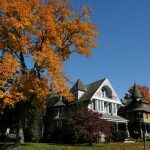 In an effort to stem the racial animosity that such transitions prompted, citizens in some racially changing suburbs like Pennsauken, New Jersey, as well as Lansdowne and Upper Darby, Pennsylvania, formed organizations to support minority homebuyers and combat racial discrimination in housing. After 1970, however, some inner suburbs experienced population decline, especially losing white households to outer suburbs and, starting around 2000, to Philadelphia’s downtown. The racial makeup of inner suburbs grew more varied than in outer suburbs whose residents continued to identify predominantly as “white alone” in U.S. Census figures. In a few of the region’s distressed inner suburbs such as Chester and Yeadon, Pennsylvania, racial integration could not be maintained and a process of resegregation into predominantly minority communities ensued by the end of the twentieth century. Inner suburbs increasingly became a destination of choice for immigrants to the region. By the twenty-first century, immigrant settlement in the inner suburbs followed class divisions as educated professionals chose upper-class enclaves and working-class immigrants gravitated to the more affordable working-class areas with easily accessible public transit. Inner suburbs recorded disproportionate shares of elderly residents, although the trajectory was decidedly upward for both inner and outer suburbs. And poverty began to rise in the inner suburbs, mirroring national trends as well as the trajectory of Philadelphia’s inner city neighborhoods. The public schools in distressed suburbs came to be counted among the worst performing in the region. In Pennsylvania in 2014 more than 40 percent of third graders and eighth graders tested below their grade level for reading in underfunded districts like Pennsylvania’s William Penn School District, Southeast Delco School District, Norristown Area School District, and Bristol Borough. A number of factors explained these trends of population decline, demographic change, and increased poverty in Greater Philadelphia’s inner suburbs as well as under-performing schools in certain places. Outdated post-World War II housing stocks and aging infrastructure made many older suburbs less appealing to homebuyers. The regional tide of deindustrialization undermined working-class manufacturing suburbs. In addition, the region’s governmental fragmentation, assigning each suburb responsibility for taxation and service delivery within its boundaries, played a role as small suburban jurisdictions struggled to fund services on a stagnating tax base. The most threatened were bedroom communities that lacked commercial property to bolster tax revenues. For example, the William Penn School District was created in 1972 to serve six small boroughs clustered together near Delaware County’s border with Philadelphia. All were residential communities with little commercial tax base, so the full weight of paying for local services and schools fell on homeowners. Thus inequalities widened among inner suburbs as prosperous communities strategized effectively to strengthen their amenities and advantages with a focus on commercial and office park development as well as educational and medical infrastructure, leaving more vulnerable places to decline. Struggling inner suburbs were thus caught in a “policy blind spot,” overlooked in policy debates that contrasted flourishing outer suburbs with declining cities. Even as some inner suburbs declined, however, others possessed qualities that positioned them to prosper. Many smaller boroughs offered the charm, walkability, sense of community, and main street orientation that the Delaware Valley Regional Planning Commission touted in its promotional campaign for the region’s treasured “Classic Towns.” Boroughs such as Narberth and Media in Pennsylvania, and Collingswood in New Jersey, began drawing people to their independently owned main street shops and restaurants as well as their robust community life centered on festivals and public events. Conshohocken successfully capitalized upon its traditional town layout to reinvent itself as a major hub of the region’s knowledge economy. The ample inventory of older housing built before 1939 offered stately and unique architectural features increasingly of interest to homebuyers. The Philadelphia region’s densely settled inner suburbs exhibited far greater variation than its outer suburbs. In this complicated metropolitan mosaic, pockets of distressed places developed side-by-side with prospering ones. But all shared the continuing geographic advantage of easy access to central Philadelphia in an era when sprawled development patterns shifted growing numbers of suburban residents farther away from, and less able to sustain, connections with the region’s core. Suzanne Lashner Dayanim holds a Ph.D. in Geography and Urban Studies from Temple University. Her dissertation measured the value of community facilities to inner ring suburban resilience. Adams, Carolyn, David Bartelt, David Elesh, and Ira Goldstein. Restructuring the Philadelphia Region: Metropolitan Divisions and Inequality. Philadelphia: Temple University Press, 2008. Hanlon, Bernadette. Once the American Dream: Inner-Ring Suburbs of the Metropolitan United States. Philadelphia: Temple University Press, 2010. Hudnut III, William. Halfway to Everywhere: A Portrait of America’s First-Tier Suburbs. Washington, D.C.: The Urban Land Institute, 2003. Leigh, Nancey Green and Sugie Lee. “Philadelphia’s Space In Between: Inner-Ring Suburb Evolution. Opolis, 1(1): 13-32. Puentes, Robert and David Warren. One-Fifth of America: A Comprehensive Guide to America’s First Suburbs. The Brookings Institution Metropolitan Policy Program, Washington, D.C., 2006. Singer, Audrey, Domenic Vitiello, Michael Katz, and David Park. Recent Immigration to Philadelphia: Regional Change in a Re-Emerging Gateway. The Brookings Institution Metropolitan Policy Program, Washington, D.C., 2008. Smith, Neil, Paul Caris and Elvin Wyley. “The Camden Syndrome and the Menace of Suburban Decline: Residential Disinvestment and its Discontents in Camden County, New Jersey.” Urban Affairs Review, 36(4): 497-531. The New Neighbors (2009), a documentary revolving around suburban Pennsauken, New Jersey, and shifting demographics. Torrice Media, 2009. The Philadelphia Story (1940), starring Katharine Hepburn, famously captured Main Line prestige. Silver Linings Playbook (2012), filmed largely in Upper Darby, Lansdowne, Ridley Park, and Norristown, Pennsylvania, evoked the working-class feel of life and landscape in those places. The Goldbergs (2013), television situation comedy set in 1980s Jenkintown, Pennsylvania, portrayed a slice of life in middle class suburbia built during the post-war era of mass suburbanization. Delaware Valley Regional Planning Commission Library, 190 N. Independence Mall West, Eighth Floor, Philadelphia. Delaware County Historical Society, 408 Avenue of the States, Chester, Pa. Historical Society of Montgomery County, 1654 DeKalb Street, Norristown, Pa.
Camden County Historical Society, 1900 Park Boulevard, Camden, N.J.
Burlington County Historical Society, 451 High Street, Burlington, N.J.
Gloucester County Historical Society, 17 Hunter Street, Woodbury, N.J.
Ardrossan Estate, inspiration for The Philadelphia Story, 811 Newtown Road, Villanova, Pa.
Bristol Historic District in Bristol Borough, Pa.
Haddon Heights Train Station, former stop on the Philadelphia and Atlantic City Rail Line, 116 West Atlantic Avenue, Haddon Heights, N.J.
Levittown Library, 7311 New Falls Road, Levittown, Pa.
Market Street in Millbourne Borough, Pa. Millbourne is the town with the highest concentration of Asian Indian people in the United States. The Wharf at Rivertown, renovated office building that once housed the Chester Power Station, 2501 Seaport Drive, Chester, Pa.